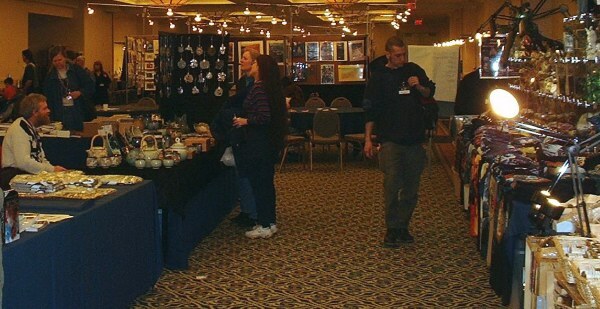 A panorama of the Dealers' Room. The Art Show is visible in the background. 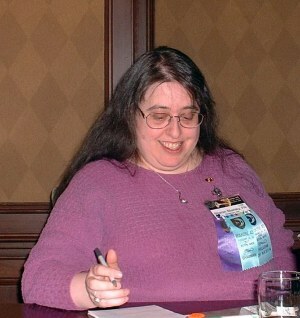 Convention Chairman Sharon Sbarsky taking notes during the Mid-Course Correction Panel, which head remarkably few complaints about the direction in which the con had been steering. Larry Smith, bookseller, toils behind his amply stocked table. Keeping up a Boskone tradition, the Con Suite was spacious and well provisioned with snacks - but no alcohol, for reasons best left unrecounted. 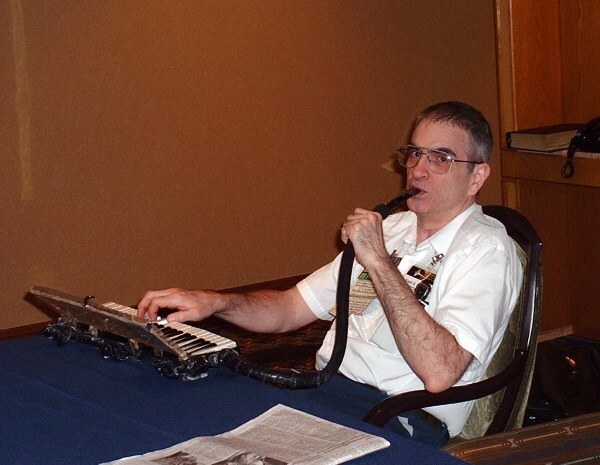 Erwin ("Filthy Pierre") Strauss, editor of The Connection, belts out melodies around the corner from the Con Suite. 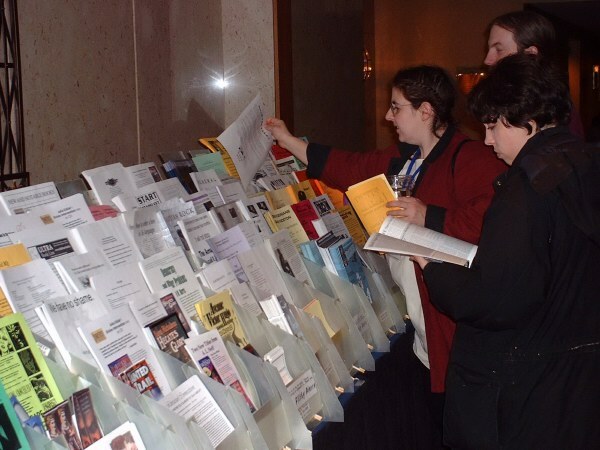 Fans pore over the freebie racks, a new design by Filthy Pierre (see above). 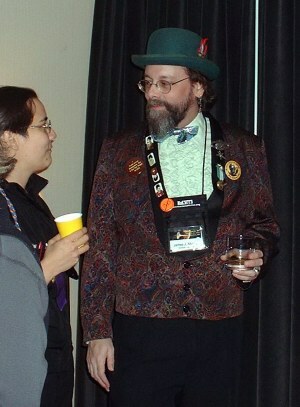 Jim Murray, dressed up in behalf of the Kansas City in '06 Worldcon bid. 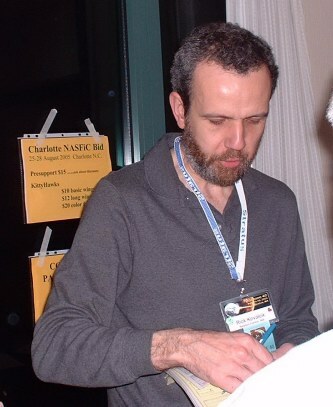 Rick Kovalcik signs up a presupporter for the Charlotte in '05 NASFiC bid. 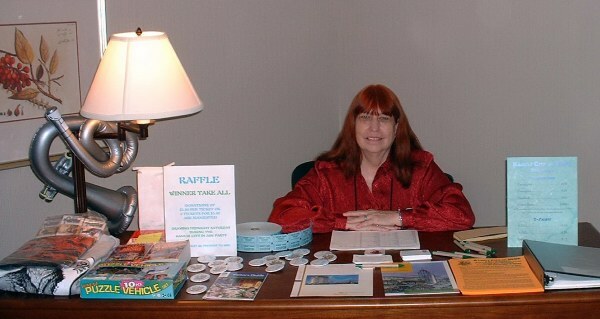 Margene Bahm, chairman of the Kansas City Worldcon bid, posing next to the "winner take all" raffle prizes, most of them closely related to George R. R. Martin. 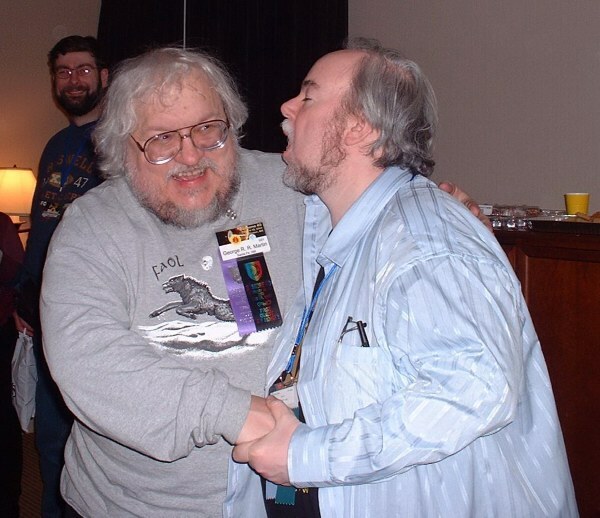 George R. R. Martin (left) congratulates raffle winner Ira Donewitz, who bellows out a hymn of triumph. Torcon 3 chairman Peter Jarvis is seen in the background.